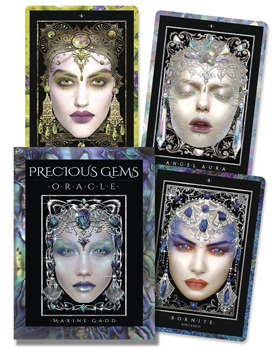 In the Precious Gems Oracle, the magic and wisdom of gemstones come to life. Discover the face of Amethyst, look Emerald in the eye, and delight in the reflective splendor of Moonstone personified. Beloved artist Maxine Gadd has created an oracle that flawlessly unites practical, earth-based guidance with blessings and higher knowledge. The informative and comprehensive guidebook includes the healing properties of forty precious stones as well as a host of affirmations, interesting facts, divinatory meanings, and gem-themed layouts. Boxed kit includes a 40-card deck and a 96-page guidebook.